Dr. Robert Owens (Bryan School of Business and Economics) has been appointed the chair of the Diversity Committee for the Association for Applied Sport Psychology. As the chair, he will lead efforts to ensure the association honors its commitments to diversity and creates an inclusive community for all of its members. A sense of pride and accomplishment was palpable in the Greensboro Coliseum Friday morning. Proud graduates. Proud friends and family. Proud faculty and staff. UNCG awarded approximately 1,444 bachelor’s degrees, 281 master’s degrees, 78 doctoral degrees and four specialist in education degrees at the university’s December Commencement ceremonies. The more than 1,800 degrees include Spartans who met their graduation requirements in August. A hooding ceremony for doctoral graduates was held the day before. Commencement speaker Terry Akin, CEO of Cone Health, left the new graduates Friday with three lessons he’s learned over the course of his life: Never stop learning, have integrity and be kind. Akin encouraged the Class of 2017 to have a growth mindset – to learn and become better each day. “There is a reason this is called commencement. It’s a beginning,” he said. Namely, the beginning of a new learning journey. Akin recognized one Spartan by name: 82-year-old Phil Koch, UNCG’s oldest graduate, who earned his bachelor’s degree in history. “If you want to be inspired by the thought of lifelong learning, look no further than your own fellow graduate,” he said. Akin encouraged the Class of 2017 to act with integrity by honoring commitments and being transparent. And above all else, he implored them to be kind. Degrees were conferred, tassels were turned and cheers rang out across the coliseum. And with that, more than 1,800 new UNCG alumni began the next chapter of their lives. Dr. Gay Ivey (Teacher Education and Higher Education), the William E. Moran Distinguished Professor in Literacy, became President of the Literacy Research Association at its annual conference held recently in Tampa, Florida. Her term runs through December 2018. The Literacy Research Association is an organization aimed at advancing literacy research, theory, and practice. LRA supports the development of emerging and established scholars and the dissemination of high-quality research intended to improve literacy and literacy education. UNCG was well represented at the LRA annual conference, with faculty and graduate students presenting a range of original research to peer colleagues from around the world. A new business has opened in Spartan Village II. 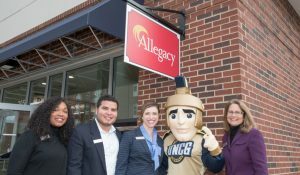 Allegacy Federal Credit Union opened a financial center as part of UNCG’s new Health and Wellness Millennial District. The credit union in UNCG’s new mixed-use project held its grand opening last Thursday. And it has a special health and wellness themed offer for those who hold a membership in UNCG’s state-of-the-art Leonard J. Kaplan Center for Wellness. Allegacy’s AllHealth Wellness Savings Account is available to current and new members of the Kaplan Center. Designed as an incentive to be more active, the wellness savings account offers financial rewards for visits to the wellness center. Members will earn higher returns on their savings based on the number of visits to the center each month. Participants can earn up to 1 percent APY on a savings balance of up to $10,000. Allegacy Federal Credit Union was established in the Triad in 1967 to serve the employees of RJ Reynolds Tobacco Company. Today the Credit Union is one of the largest in the state and has over $1.2 billion dollars in assets, serving over 750 Select Employer Groups with over 138,000 members worldwide. They offer a full array of financial services for consumers and businesses including retail and commercial banking services, investment services, benefit solutions, payroll and much more. Dr. Sonja Frison (The Center for Youth, Family and Community Partnerships) received new funding from Sandhills Center, Local Management Entity, for the project “Juvenile Justice Substance Abuse Mental Health Partnerships.” This project is supported by funds from the NC Department of Health and Human Services Division of Mental Health, Developmental Disabilities and Substance Abuse Services. The Juvenile Justice Substance Abuse and Mental Health Partnerships (JJSAMHP) is a statewide initiative designed to provide a continuum of care for juvenile justice involved youth with behavioral health issues. The North Carolina Division of Mental Health, Developmental Disabilities and Substance Abuse Services works collaboratively with the North Carolina Department of Public Safety, Juvenile Justice Section to provide resources and support for 18 local teams within the JJSAMHP network to increase service utilization, enhance services, and infuse evidence-based and best practices. The UNCG Center for Youth, Family and Community Partnerships provides technical assistance and training for this initiative. UNCG’s role in the initiative is to: 1) provide technical assistance activities to the sites and communication about site visits to state level partners; 2) increase avenues and methods of training and information sharing re: state and local partners; and 3) increase awareness and usage of evidence based practices/treatments and best practices for juvenile justice involved youth. Dr. Brett Carter (Student Affairs) received new funding from the North Carolina Department of Health and Human Services for the project “Collegiate Recovery Community.” Recovery is “a process of change through which individuals improve their health and wellness, live a self-directed life, and strive to reach their full potential” (SAMHSA 2012). UNCG’s Spartan Recovery Program (SRP) believes that there are multiple pathways to recovery and encourages students to develop and maintain an active recovery and wellness plan. The vision of the SRP is to be a model recovery-minded community that engages and encourages students in their pursuit of an enriched college experience and sustained recovery. The SRP creates a recovery-minded community of empowerment, purpose and inclusion in which UNCG students in all phases of recovery can pursue their personal goals for the purpose of enhancing personal wellness and contributions to the global community. The SoCon season starts late this month, and the Spartans men’s team has been looking sharp – as they hold a three-game win streak. Last night, the team defeated UNC Wilmington 71-58. The Spartans, who entered the game fifth in the nation in scoring defense at 59.0 points per game, held UNCW to its lowest scoring total of the season. The team on Dec. 7 defeated Elon 75-44. The win was the first for the Spartans against the Phoenix since 2010. Earlier in the month, junior guard Francis Alonso (shooting, in photo) had a career-high 36 points to lead the Spartans to a thrilling come-from-behind triple overtime victory on the road at Liberty. Alonso was clutch in the win, hitting the game-winning basket with 2.4 seconds left in the triple overtime period. He also hit game-tying 3-pointers at the end of regulation and at the end of the second overtime period to keep the Spartans alive, essentially giving him three last-second shots in one game. The wins have improved UNCG to 7-3 on the year. The team has been fun to watch. And they will have several great home games in the coming weeks. Wofford, Dec. 30, 5 p.m., Coliseum. Youth Basketball Day: Do you coach a youth basketball team, or does your child play on a youth team? Youth ticket packages are $10 each and include a ticket to the game and a mini basketball hoop set. Parent tickets are $5 each. Minimum of 10 tickets to receive this group package. To order your group tickets online, click this link. The team also visits NC State this Saturday (Dec. 16). Visit this webpage for men’s basketball ticket information. The women’s team has four wins and five losses, with several home games in Fleming in the coming weeks. Tickets are free admission for faculty/staff, with UNCG ID. Tusculum (Dec. 19), High Point (Dec. 28), and Lees-McRae (Dec. 31) are scheduled for this month, and CW will have a preview of game promotions for January soon. Details on the December games are here. Updated Dec. 14 to include information on UNCW game. The purpose of the Information Literacy Course Development Awards is to support instructors in revitalizing courses to foster information literacy skills. These re-envisioned courses incorporate information literacy throughout the semester, teaching students to locate, evaluate, synthesize and cite sources in the manner most appropriate for the subject area. Following the demand from UNCG staff and the success of the Staff Senate’s free tour of the Union Square Campus last summer, the Staff Senate Personal & Professional Development Committee will host/organize the second trip for this year: to state-of-the-art JSNN Campus. The tour will be this Friday, Dec. 15, 1-3 p.m.
Free bus transportation will be available, sponsored once again by the Department of Educational Leadership & Cultural Foundations. Enrollment and seats are available for 30 people. Come explore and learn more about our UNCG campuses, especially the advanced technology and services available at the JSNN facility. Please register at https://workshops.uncg.edu/workshops-by-category.jsp?cat_id=77001540 to secure your seats or contact Bruce Pomeroy, Staff Senate Personal & Professional Development Committee, at bepomero@uncg.edu or 334-5913. The 2018 University Holiday Schedule has been finalized and is now located on the UNCG HR website for your operational planning. The schedule adopted by the State Human Resources Commission for SHRA and EHRA Non-Faculty employees has been revised to meet the needs of our campus. For your convenience, both the 2018 and 2017 University Holiday Schedules will remain accessible on the UNCG Human Resources website. Please review the 2017 Winter Holiday Schedule to ensure you plan and record time appropriately. While the university will be closed the week of December 25-29, eight (8) hours should be charged to vacation leave, bonus leave or compensatory time for Friday, December 29, 2017. Answers to questions regarding holiday eligibility requirements and premium holiday pay can be found on the website. General questions regarding the holiday schedule should be directed to Victoria Benson, Deputy Chief Human Resources Officer atv_benson@uncg.edu or (336) 334-5210. The SHRA Disciplinary Action Policy is intended to provide tools for addressing employee conduct and performance issues in a reasonable, consistent, and effective manner. On Sept. 7, 2017, the State Human Resources Commission approved revisions to the SHRA Disciplinary Action Policy (formerly called the “Disciplinary Action, Suspension, and Dismissal Policy”). This policy took effect as of Nov. 1, 2017. Although these revisions do not significantly change the current policy and practice of the state, there is a significant restructuring of the policy itself. Some aspects of the disciplinary process that were undefined in the former policy have been articulated in the new policy to foster greater consistency of practice. The key changes can be found HERE. SHRA employees or their supervisors MUST REGISTER TO ATTEND. SHRA employees or supervisors who are unable to attend one of the forums may view the new SHRA Disciplinary Action Policy on the UNCG Human Resources website. A One-Page Policy Summary is also available for review and reference. For questions related to the forums or the new policy, contact Gwen Evans, Director for HR Business Partners and Employee Relations, at gdevans2@uncg.edu or (336) 334-5212. If there’s one person who knows UNCG’s history, it’s University Archivist Erin Lawrimore. From the days of McIver to the Woman’s College era to the arrival of men in the 1960s and beyond, she’s uncovered some fascinating stories that don’t often get told – student Lucille Pugh’s dedication to getting an education, no matter the cost; faculty member Mary Channing Coleman’s beloved terrier “Bonnie”; and the gutsy mentality that drove so many students to make a difference across the nation. In celebration of UNCG’s 125th anniversary, Lawrimore shared some of her favorite stories from UNCG’s 125 years – interesting people, places and moments – and how she sees the university moving forward. Check out the highlights in the Q&A below. What stands out about UNCG’s archival collections? When the school first opened its doors in 1892, folks knew they were doing something special. And because they knew that, they kept everything. We have about 140 boxes of materials from founding president Charles Duncan McIver, including really specific items like letters of recommendation for students. They were purposely saving stuff because they knew that a public university for women was groundbreaking, and they wanted to document it. Who is your favorite student from UNCG’s 125-year history? Lucille Pugh. She never graduated from the North Carolina State Normal and Industrial College, but she studied here for several years. Pugh arrived in 1899 with no money – she actually wrote a letter to McIver and told him she was willing to do anything to get an education. Pugh got a job on campus and worked her way through school. Finally, one semester she just couldn’t come up with the money. She had to withdraw, and she ended up moving to New York City to live with an aunt and enrolling in night classes at New York University’s law school for women. She graduated with a law degree and became the first woman in the United States to defend an accused murderer in court. Who is your favorite faculty member? Mary Channing Coleman, in large part because of her dog. She was the founding head of the Department of Physical Education, and the Coleman Building is named in her honor. Coleman took her dog Bonnie with her to every single class. And she was tough. She handpicked each of her majors – she would interview all prospective students to make sure they didn’t just like sports, but were actually interested in physical education. What is the most interesting relic in University Archives? The thing that everyone loves is the death mask of Charles Duncan McIver. It creeps me out – I wouldn’t want to look at it every day. But people love it, so it’s on exhibit all year long. What is your favorite historical spot on campus? One thing that people don’t tend to notice is the cornerstone for the old Students’ Building – located in the bushes between the Minerva statue and College Avenue. The cornerstone was laid in 1902, construction finished in 1906 and the building was torn down in 1950. It housed the post office, meeting halls for literary societies, the auditorium and other spaces. It was a beautiful building, but eventually it started to fall apart. Who was the most famous campus visitor? It depends on who you ask, but personally I like Eleanor Roosevelt because she came to campus multiple times and engaged with students, faculty and staff. She was the face of progressive women at the time, so it made sense to bring her to campus. What have you been most surprised to learn during your six years as university archivist? I think a lot of people don’t realize how forward-thinking this school has been since the beginning. Students here were advocating for change statewide before they had the right to vote. They came in with a purpose. I’ve always admired their ability to make something happen, even when the cards were stacked against them. Why is UNCG’s history important and relevant to students on campus today? You can’t know where you’re going if you don’t know where you’ve been. A lot of what we do, if you look closely, still traces back to McIver’s vision. For example, health and wellness and visual and performing arts – we’ve always been a leader in those areas. Looking back helps guide us forward. With students in particular, it helps them see where they fit in. The stories of former students show current students how they can make a difference. Knowing where we’ve been, where do you see the university heading in the next 15-20 years? I think our students, faculty, staff and alumni are really excited about how we’re moving forward. Right now, people feel a lot of pride being associated with UNCG. With Chancellor Gilliam’s mission of “Giant Steps,” we have an opportunity to think bigger. We have an opportunity to make a major impact across the state, and I think we’re doing it already. With its move to the center of campus under the Fountain View Dining Hall, the UNCG Sustainability Office is creating opportunities to help make the issues of sustainability visible in some less expected ways as well. In a pilot effort titled “Make a Show of It” the UNCG Sustainability Office has equipped the front half of its new office space to function as an art gallery and hired two student art curators who will each mount shows in Spring 2018. Self – due Feb. 6, 2018. Submittals are open to students, faculty, staff, and the broader community with priority given to artists with UNCG connections. Funding for the pilot has been provided by the UNCG Green Fund. Consistent access to primary medical and behavioral health care reduces cost, increases capacity within the tertiary health care system and enhances the wellbeing of communities overall. Studies demonstrate that individuals without permanent housing, and other health disparate population groups, such as immigrants and refugees, access primary health care and other health wellness services at far less frequency than that of the general population. Affordability, accessibility (transportation) and availability (long wait list, inconvenient hours) are commonly cited causes for vulnerable individuals’ inability to secure necessary, ongoing coordinated health and behavioral care. In addition to the foregoing, obstacles to care may include difficulty navigating a fragmented human service delivery system, untreated mental illness or substance abuse, fear of stigmatization, language or other cultural barriers. An integrated care approach, within an interdisciplinary model of care, and augmented by other ancillary community-based, co-located service agencies, especially those offering supported housing, have proven to be highly effective program models. With its creative, collaborative, community-based model, CSWEI has successfully developed and implemented programming that addresses the needs of each of these vulnerable population groups and has been effective in linking health desperate individuals to care. This project focuses on connecting researchers across the UNC system who are using (or interested in using) virtual reality (VR) to address human health challenges. VR is a tool that can be adapted for practically any setting, allowing researchers and clinicians the flexibility to develop tailored interventions for their populations of interest. Recent advancements have made VR more portable and user-friendly, as well as significantly more affordable. Connecting VR researchers across the UNC system will help synergize collaborations across institutions and disciplines, positioning the UNC system as a leader in the use of VR to address human health challenges. Enjoy this video interview – and read his profile in the News & Record. Donations are still being received for the UNCG SECC. If you wish to donate, please do so this week. Nearly 1 in 3 Spartan employees have contributed so far this year, said Macea Whisettse, chair of UNCG’s SECC. “Currently, we’ve reached $183,375 (89 percent) of our goal and 31 percent participation,” she said last Friday. The SECC is the official giving campaign for North Carolina state employees, supporting 900 charitable organizations in our region and state. In UNCG’s 125th anniversary year, Chancellor Franklin D. Gilliam, Jr. joins the university’s Miles Davis Jazz Studies Program students, led by Professor Steve Haines, for a special holiday jazz recording session. It was a featured part of the chancellor’s Holiday Card this year. Enjoy! UNCG will confer more than 1,800 degrees at the university’s December Commencement ceremonies. The university-wide commencement will take place Friday, Dec. 8, at 10 a.m. at the Greensboro Coliseum. The doctoral hooding ceremony will take place Thursday, Dec. 7, at 3 p.m. at UNCG Auditorium. The degree total includes approximately 1,444 bachelor’s degrees, 281 master’s degrees, 78 doctoral degrees and four specialist in education degrees. The more than 1,800 degrees include Spartans who met their graduation requirements in August. Of the degrees awarded, 99 will be conferred to international students. A livestream of the Friday’s commencement ceremony can be accessed here. The hooding ceremony Thursday may be viewed here. For more information, visit reg.uncg.edu/commencement-central. When Lauren Allen’s father unexpectedly passed away a month ago from a heart attack, the registered nurse couldn’t help but wonder if things would have turned out differently if he’d lived in a big city. In the rural mountains, he was far away from a major heart center. Allen is among 44 students in UNCG’s Post-Baccalaureate Adult Gerontology Primary Care Nurse Practitioner (AGPCNP) Doctor of Nursing Practice (DNP) program training to help rural residents gain access to medical care, thanks to a $699,700 grant from the Department of Health and Human Services (DHHS) Health Resources and Services Administration (HRSA). “We need more providers, in more places, so that people have the opportunity to access affordable, quality care,” Allen said. Adult Gerontology refers to adolescents and adults 13 years and older. Projected growth indicates America’s older adult population will more than double by year 2060 to 98 million people, according to a 2015 study by the Administration on Aging. North Carolina, a state where 80 out of 100 counties are rural, has a substantial number of medically underserved populations, noted Dr. Laurie Kennedy-Malone, professor of nursing and project coordinator/principal investigator of the “Advancing Nursing Education Workforce: Academic Practice Partnerships Today for Competent Practitioners Tomorrow” grant. Dr. Karen Amirehsani, preceptor coordinator, and Dr. Kristin Curcio, AGPCNP project coordinator, are actively working with Kennedy-Malone to fulfill the project objectives, which are twofold: 1. Improve access to quality healthcare by preparing adult gerontology primary care NPs to manage the complex health needs of adults and older adults, rural and medically underserved populations; and 2. Enhance the AGPCNP DNP program curriculum by ensuring that students recognize the impact of the social determinants of health on the delivery of healthcare through the use of clinical simulations, competency measures and the use of select clinical sites that serve diverse adult and older adult populations to include patients in rural and medically underserved areas. Older adults are medically underserved due to physical handicaps, lack of resources and inadequate transportation systems that make healthcare inaccessible, according to DHHS. North Carolina has a significant number of medically underserved populations in diverse counties both urban and rural, with a growing, aging diverse population. DHHS estimates by 2025, the projected demand for nurse practitioners in North Carolina will reach 8,640. North Carolina has eight universities that offer nationally accredited graduate nurse practitioner programs, but only three prepare NPs to specialize in adult gerontology primary care, of which one is UNCG. Funding from the grant will allow for enhancements in the curriculum to address social determinants of health in medically underserved communities and prepare AGPCNPs to care for these populations through partnerships with local healthcare facilities. Funding is for one year, and if successful, UNCG could receive the same funding next year, explained Kennedy-Malone. The project has designated three academic-practice partnerships – Novant Health systems, Davidson Medical Ministries Clinic and Cone Health Community Health & Wellness Center. An underlying goal of the grant will be to increase the number of partnerships in the upcoming year. The School of Nursing has contracts with over 500 clinical agencies throughout North Carolina. Additionally, she added, the grant will provide educational opportunities for “preceptors” – clinicians who train and mentor NP students in a clinical setting. Training is provided for current mentors as well as graduating students. Preceptors play an integral part in preparing nurse practitioners. Austin Beshears, a grant fund recipient, plans to use the clinical training to better serve the rural community where he grew up, in Elkin, North Carolina. Specialists in rural areas are hard to come by, he said, and patients often face a commute of up to an hour. Lancaster has fewer than 1,500 people, Harvey said, so it’s easy for her to relate to the healthcare disparities facing rural communities targeted by the grant. This fuels her passion for the project and her goal to bring healthcare to underserved areas. Harvey works at Moses H. Cone Memorial Hospital while tackling a full course load. Rather than digging into her savings, funding from the grant helps to cover unmet costs. It’s a sentiment shared by most of the students, who receive about $2,500 each. Have you ever heard of a SMART tunnel? What about a chicken bus? Flying cars? Bamboo train? Run-commuting? Which one would you choose? A Stormwater Management And Road Tunnel (SMART) will reduce flash floods and traffic jams, but on a chicken bus, you could carry your livestock up top. For a flying car, you’ll have to wait a few years. A bamboo train is affordable, but you may have to disassemble your train car along the way. After run-commuting, you may need a shower. “There is no single best way of traveling, and the possibilities of making our way are almost endless,” says Dr. Selima Sultana, co-editor of “Minicars, Maglevs, and Mopeds: Modern Modes of Transportation around the World,” a collection of mini essays published this year by ABC-CLIO. Before “Minicars, Maglevs, and Mopeds,” there was not, to Sultana’s knowledge, a single reference book that covered a wide variety of contemporary transportation modes, technology and routes around the world. And maglevs, fast-moving railway systems that use magnetic force to propel a levitated train, are only the beginning. The book can serve as a textbook for students, but can also be, as Sultana says “a nice coffee table book,” because of its vibrant photographs. It shows daily transportation across the globe, highlighting unusual forms and new technologies that will guide the transportation future. The essays can help readers understand how transportation has costs and consequences for the environment, human health and social structures. “Transportation should be considered the center of attention for urban land-use policy,” says Sultana, whose research topics include transportation sustainability and how transportation influences social inclusivity, economic accessibility, health and cultural diversity. Students in her courses design projects that center on national-scale topics, and those at a local level. They may study the economic effects of Charlotte’s light rail or the impact of walking and biking accessibility for children in Guilford County. For the Travel Behavior Change project, students evaluate and change their own personal travel behavior with the goal of reducing their transportation-related environmental footprints and minimizing negative health effects associated with their modes of travel. Through this project they better understand Greensboro’s transportation options, as well as how they can reduce greenhouse gases through their transportation choices. While Sultana has her own favorite modes of transportation – first trains, then walking and then the London Underground – co-editing “Minicars, Maglevs, and Moped” exposed her to some unusual and fascinating modes of transportation. “Many of the contributors suggested entries that we had never heard of before,” she says. When you think of UNCG, you think of Minerva, the blue and gold and – for many Spartans – Dr. Cherry Callahan. That was alumnus Justin Outling’s assessment, as he spoke at Vice Chancellor Callahan’s Retirement reception in a filled Cone Ballroom last Wednesday. And the observation rang as true as the university bell. SGA president Holly Shields noted that she has made “a culture of care.” Jill Beville remarked on her spirit, and Tim Johnson noted that she is always there for the students and others: her presence is so meaningful. Dean of Students Brett Carter, serving as host for the proceedings, introduced more well-wishers from all parts of the university. Dean Celia Hooper noted that “you’ll find her whenever help is needed.” Kelly McKee, president of the Junior League (of which Callahan was once president), spoke of her service. Provost Dunn noted the impact she has had through so many lives touched each year, for 38 years in Student Affairs. “It’s beyond measure,” she said. Her daughters, Megan and Kathleen, spoke of their mother, including her sacrifices in order to serve the students for nearly four decades. Finally, Dr. Callahan addressed the crowd of well-wishers. “It means a lot to know you’d come out and hear all this stuff up here.” She was too modest: That “stuff” included a presentation of the state’s highest honor: the Order of the Longleaf Pine. She will be in her office through the 19th, she noted, but having the event before exams allowed students to attend. And there were many. And they not only represented our campus’ present and future, also its heritage as well. Twenty university marshals, with their traditional gold sashes, greeted guests. The student Spartones ended the tribute by singing the Alma Mater. I am delighted to announce the appointment of Dr. Cathy Akens to the position of Vice Chancellor for Student Affairs. Her appointment is effective January 29, 2018. Dr. Akens is Associate Vice President for Student Affairs and Dean of Students at Florida International University, one of UNCG’s national peer institutions, and has a long and distinguished record of leadership within Student Affairs. She was appointed as FIU’s first Dean of Students and prior to that served as the senior student affairs officer for FIU’s branch campus on Biscayne Bay. Previously, she worked in the area of housing and residence life at FIU and Bowling Green State University. Since 2002 Dr. Akens has taught at the graduate level in FIU’s higher education program. She has been engaged in professional service and scholarship throughout her career, and is currently co-editing a book on college students and their environments. Dr. Akens was selected for this position following a national search. I wish to express my gratitude to the Search Committee for their time and efforts. In addition, I am grateful to all members of the University community who took part in interviews, attended Dr. Akens’ campus forum, provided comments following candidate visits, and otherwise contributed to the successful outcome of our search. Please join me in welcoming Dr. Akens to our campus community. I am confident that she will prove to be an outstanding resource for our students, faculty, and staff. Cone Health CEO Terry Akin will deliver the keynote address at the university’s Dec. 8 Commencement ceremony at the Greensboro Coliseum. More than 1,800 students are receiving degrees. Akin assumed the role of chief executive officer of Cone Health on Oct. 1, 2014. He joined Cone Health in July 2009 as chief operating officer and was named president in April 2012. Prior to joining Cone Health, Akin held progressively responsible senior executive positions at Harris Methodist Fort Worth Hospital and Presbyterian Hospital of Dallas (both part of the Texas Health Resources system). Akin earned an MBA from the Wharton School at the University of Pennsylvania along with a master’s degree in social work from Penn. He also holds a bachelor’s degree in psychology from Texas A&M University, College Station. Akin is a fellow of the American College of Healthcare Executives. He was named to the Triad Business Journal’s “Most Admired CEO” list in 2016. Akin serves as chairman of both the Greensboro Chamber of Commerce and the Guilford County Development Alliance. In addition, he co-chairs the “Ready for School, Ready for Life” collaborative aimed at early childhood education and school preparedness. Akin is also a member of the North Carolina Hospital Association (NCHA) Board of Directors. As of last Friday, UNCG faculty and staff have raised $162,503 for the SECC. The goal is $200,125. The campaign ends Friday. (Donations are accepted and tallied through the end of the month. You can help UNCG show our “Power of Giving” by making a contribution to the SECC here, if you haven’t already. By the end of the first day of exams, around 70 apples lay at Minerva’s feet and the statue’s base. Whether it really brings luck for the students, who knows. But those apples sure are a stroke of fortune for the Spartan squirrels in search of a quick meal. 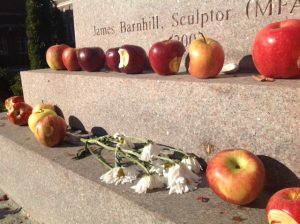 I’d talked with Jim Barnhill this fall about Minerva. He’s the sculptor – a UNCG alumnus – who created the statue. 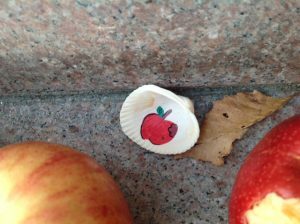 He noticed a student placing an apple at Minerva for good luck as we chatted one afternoon mid-semester. They exchanged pleasantries. Barnhill encouraged him to study. Point taken. I’m sure they all did, a lot. And here’s best wishes to all the students this time of year – doing their best to show their accomplishments and to prepare for making an impact on our world. A new business is opening in Spartan Village II. Allegacy Federal Credit Union is opening a financial center as part of UNCG’s new Health and Wellness Millennial District. The credit union in UNCG’s new mixed-use project is holding its grand opening this week. As part of the General Education Self Study Task Force’s work, we have looked at how other institutions have organized their General Education programs. UNCG has its own identity and mission, so simply replicating another institution’s program is neither possible nor desirable. However, looking at how other institutions have designed their General Education programs suggests the range of possibilities in designing such a curriculum and offers ideas for possible improvements in the delivery of our own General Education program. The document here provides an introductory look at the variety of General Education programs around the country. A recent article in Inside Higher Ed also provides a summary of the AAC&U’s 2016 survey findings regarding the frequency with which various models and/or features of General Education are currently being used. As part of the current ongoing conversation about General Education at UNCG, we invite you to look at these materials and share any thoughts/comments/suggestions you might have with the Task Force. We value your input on this and any other topic relevant to General Education as we work on completing the self-study. You may provide comments here. 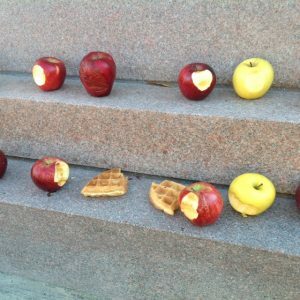 Art is always on display on campus, even when we’re not. You can catch some unique exhibitions at the Weatherspoon Art Museum through Dec. 21. Tuesday, Dec. 12, December’s Noon @ the ‘Spoon tour will feature the exhibition “Louise Fishman: A Retrospective.” The tour, which is 20 minutes long, will begin at noon. The Weatherspoon is the only Southern venue that will feature these works, which cover from 1967 to the present. Fishman uses Abstract Expressionism to create large-scale gestural paintings that share the physicality, dynamism and emotional power of that movement, without bravado. Her work is inspired by her profound dedication to feminism and aspects of her Jewish background. The exhibition will be available for viewing through Dec. 21. See the Weatherspoon Art Museum website for days and hours. For more information or questions, contact Loring Mortensen at lamorten@uncg.edu. The Association of College and Research Libraries (ACRL) Student Learning and Information Literacy Committee has announced the selection of Jenny Dale as one of its newest presenters for the one-day workshop, Engaging with the ACRL Framework: A Catalyst for Exploring and Expanding Our Teaching Practices. She will join the current presenter team as a partner in shaping the curriculum and presenting the workshop. Dale is the Information Literacy Coordinator in the Department of Research, Outreach and Instruction at University Libraries, where she oversees the first-year instruction program, coordinates information literacy assessment and provides professional development training for librarian and teaching faculty colleagues. Dale also collaborates with students and faculty in the departments of Communication Studies, English, Media Studies and Women’s and Gender Studies in her role as a liaison librarian. She holds a Master of Science in Library Science from the University of North Carolina at Chapel Hill. ACRL’s presenter team brings an abundance of expertise on teaching the ACRL Framework for information literacy for higher education at a time when academic librarians need it most, but their fresh voices and enthusiasm for their new roles will ensure these workshops support librarians in enriching their teaching practices for a long time to come. The Engaging with the ACRL Framework workshop is currently offered as a “roadshow” as part of ACRL’s slate of day-long licensed workshops that can be brought to your campus, chapter or consortia at any time year-round. Contact ACRL Program Officer Chase Ollis at collis@ala.org for more information. The project seeks continued support of five cohort programs for registered nurses seeking Bachelor of Science degrees. The five established cohorts are located on the campuses of Davidson County Community College in Thomasville, Rowan-Cabarrus Community College on the North Carolina Research Campus in Kannapolis, Gaston College in Dallas, North Carolina, Forsyth Technical Community College in Winston-Salem and Piedmont Community College, Roxboro. Dr. Stuart Marcovitch (Psychology) has been appointed editor-in-chief of the academic journal Cognitive Development. Cognitive Development is the flagship journal of the Jean Piaget Society, which is an international organization that studies human knowledge and development. Starting in November, Dr. Marcovitch will begin a three-year term as editor-in-chief of the journal. The head of UNCG’s Psychology Department, Marcovitch is a specialist in developmental psychology and cognitive development in children. In addition, Markovitch is co-director of and researcher at D.U.C.K. (Development and Understand of Children’s Knowledge) Lab, which is based on the UNCG campus and studies child development. Immigrants are uninsured and face multiple barriers to access appropriate and available health care, the abstract notes. Immigrants often end up at the Hospital Emergency Departments for non-emergency health issues, and many who have real emergencies go without care. This project will assist immigrants in gaining access to health care services and navigate the health systems by providing interpreters and community Health Workers. Working in conjunction with the Guilford Community Care Network, the project will provide screening, assessment, and referral and identify to the uninsured and seek solutions to connect them to a local integrated health clinic. Dr. Edna Tan (Teacher Education and Higher Education) received new funding from Michigan State University for the project “Equitably Consequential Making among Youth from Historically Marginalized Communities.” This project is supported by funds from the National Science Foundation. Equitably Consequential Making, a Research in Service to Practice (RPP) four-year project, focuses on understanding and designing for equity in STEM-oriented making for youth from historically underrepresented backgrounds. Given the proliferation of makerspaces in education settings, the project seeks to contribute new knowledge and practice for transforming the Maker culture in ways that are equitably consequential – processes and outcomes of Making, which: a) Deepen STEM and making knowledges and practices; b) Connect STEM-making with one’s community and with broader social issues; and c) Support transformative outcomes at the individual and community level focused on learning, becoming and doing in STEM through sustained engagement in Making.